It’s a whirlwind and it’s best to be READY! 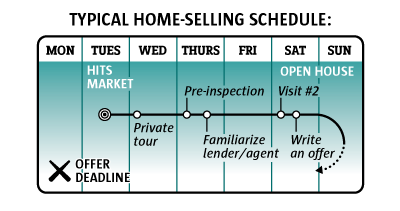 The typical home-selling schedule goes like this: A home hits the market early in the workweek. Over the next few days, interested home shoppers start stopping by the house and inquiring with the listing agent during private tours. There are open houses over the weekend. And then a deadline for everyone to submit their offers a day or two later. 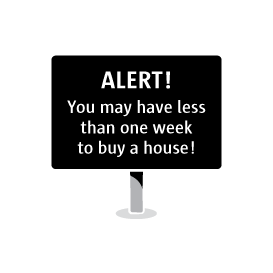 In total, you may have less than a week to decide on the biggest purchase of your life. But it’s even quicker than that: You’ll have just a few days to frantically hire someone to do a pre-inspection — which will cost a few hundred bucks and likely only give you the gist of the problems of the house; visit the house (often multiple times); make sure your lender and agent get to know the listing agent so they know you’re a legit buyer; and put together a detailed offer that includes much more than your bidding price. 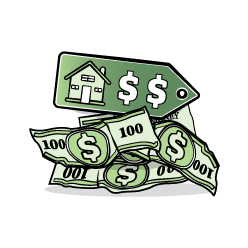 In the past two years, the cost of a median house in King County has gone up $185,000.